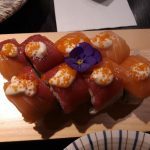 One of the (many) joys of reviewing Edinburgh’s plethora of restaurants for Lothian Life is discovering new and exciting places to eat, and Yamato is one of those hidden gems I might never have discovered. Tucked away in a side street in Tollcross, Yamato is a real find and feels authentically Japanese. Once visited it could well become your new favourite. From the stylish decor of wooden partitions which gave a sense of privacy, even though other diners are arms-length away, to the thoughtfully presented food, this meal was Japanese food at its best. Yamato introduced me to new delights, such as the Wagyu (meaning Japanese cow), a tender meat well worth trying. Navigating Japanese menus can be tricky. At Yamato help is on hand to guide you through the specials, how much to order, and which is the best first-time saki. My friend and I decided to share all the dishes so we could try as much as possible from an adventurous but extremely easy to use menu. We bravely ordered something called Snow Crab Vulcan, which resembled a volcano complete with fiery sauce and tasted divine. Crispy brussel sprouts with citrus fruit yuzu and pine nuts was absolutely delicious and turned the notion of brussels being for Christmas on its head. The lotus chips were like snowflakes – no two patterns were the same – and they tasted like fine potato chips. The Wagyu nigiri beef strips laid over rice were so tender, or “melty” as my friend described them, I can see why it is a delicacy. Yamato also sells Wagyu steak, however with such an incredible choice, we wanted to try several bite-sized dishes rather than one main one. Another special, the Otoro Sashimi was so pretty it cried out to be Instagrammed, before being devoured. This tuna dish arrived with decorative flowers and, like all our dishes, was served on pretty plates and bowls. The rituals of Japanese cuisine are an important part of the overall experience, from the saki warmed in a special flask at your table and poured into teeny bowls, to the chopsticks and small dishes filled with soya sauce and other relishes. I absolutely loved Yamato – everything about it. Staff guided us through the menu (which is very simple with helpful photographs of all the dishes). I loved the Wagyu nigiri (the steak next time) and the Snow Crab Vulcan wins the award for most novel name for a dish. This is a great place to explore Japanese cuisine safe in the knowledge that all the ingredients are fresh and feel authentic. We left feeling contently full, but not stuffed. This is Japanese food at its best.